My husband & I love football. Every week during football season we have a mini football party for the kids. They know that once we leave church on Sunday…it’s game time! We get the house ready, food in the over and start prepping for our football party menu to be complete. So you can only imagine what our plans are for Super Bowl Sunday!! To add even more excitement to our normal football party, we get to add the fact that New Orleans is host to Super Bowl XLV11. It really couldn’t get any better. I can’t let me family down. I HAVE to plan out this party out perfectly! Macy’s Culinary Council is hosting another local event at Macy’s Lakeside in New Orleans. The event will feature Marc Forgione. Marc is going show guests how we can serve delicious game winning appetizers & penalty-free savory sides. I’m going to attend & hoping to come away with a winning Super Bowl Sunday Menu. I can an MVC ( Most Valuable Chef) in my future. 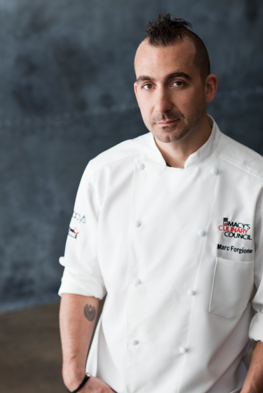 Join myself & other guests as we welcome Marc Forgione & Macy’s Culinary Council to New Orleans Macy’s Culinary Council Cooking Demo Event Feburary 2nd. Do your friends a favor and meet us there. Your bound to get some inspiration for the big game! I wish they’d do something like this near me! Very, very cool! Sounds cool! I love that you have a mini football party with your family each week – how fun! Sounds like fun! Wish I could go! Very Exciting, we have nothing like this near my area. If only I lived in NOLA! I’m a huge Top Chef fan and this would be a dream to go to. I hope you have a blast :). How fun! I loved watching him on Iron Chef! This looks like it is going to be an amazing event! Those who are able to attend are lucky, I’m sure they’ll learn a lot! Very fun! Too bad I don’t live near there. wow, that would be so amazing to learn how to make dishes from him! So jealous! Oh I wish I could attend something like this. Looks like it’s going to be so much fun. I can’t wait to see what you come up with. This sounds like so much fun..I would love to learn how to make amazing dishes like he does..Have a great time! Make sure to post lots of pics.